Economic growth is often a result of small businesses pushing the adoption of technological advancement coupled with the drive for efficient operations. Small businesses in America are the powerhouses that drive the economy. In fact, according to the Small Business Administration, they make up over 99 percent of all employer firms and account for 64 percent of all new private sector jobs. This makes the common small business owner a force to be reckoned with, therefore improving renewable energy adoption for these businesses can improve the economy while lowering their carbon footprint. “My office is eagerly awaiting the new wind farm proposed off shore in Lake Huron,” said Dr. Greenberg a general dentist in Saginaw, Mi. 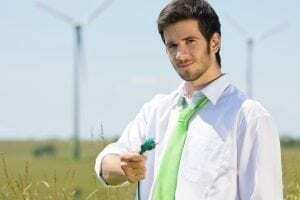 He went on to explain that “providing an office powered by renewable energy is a differentiator from the competition and should bring in an eco-conscious clientele.” Like Dr. Greenberg, many other small businesses are promoting their cost savings and sustainable profile to help boost profits. Other examples include web hosting companies, restaurants and even local farms. Other small businesses are thriving on the emerging renewable energy markets in places such as Africa and the Caribbean. Focusing on impoverished areas, companies such as Sky Energy International provided small solar solutions that can provide power for lights and charging cell phones in underdeveloped nations. “If you have no electricity at all, getting enough for a few lights and to charge a cell phone is better than nothing,” said Chris Neal, a spokesman at the World Bank in Washington, D.C.
Additionally, there are tax incentives and other programs in place to help the small business owner take advantage of renewable energy resources. For example, the U.S. Department of Energy has an entire website dedicated to grants, rebates and savings associated to renewable energy and energy efficiency programs for small businesses among other groups. This coupled with programs such as rebates from Energy Star partners and similar can help cut costs and increase profits over time, thus leading to further demand and growth within the sector. As traditional fuels become more expensive to produce, demand for alternative fuels will rise. Just ask Justin of Greasecar Vegetable Fuel Systems LLC. With sales growing more than 200 percent reaching $2.5 million in a single year, this small business owner found his niche. Making conversion kits for diesel engines to run on vegetable oil, his product is gaining traction. “Ultimately, it’s the rising fuel prices that are convincing people to get onboard,” says Carven. Craven is just one small business owner helping make a difference, but what about the general population of small businesses? Adoption of green energy is critical to reach mass appeal. Thus, as more demand for renewable energy sources such as solar, wind and hydroelectric sets in, it will help increase system capacity and efficiency, helping drive the costs down. This trend will increase the availability of green power over time, starting us on the path to sustainability and energy independence. We have history on our side. Technological advances such as cell phones, microwaves and the internet were once considered fads and of no use for modern society. Those naysayers look silly in today’s connected economy as will the critics of renewable energy. Cutting costs to increase profits at the small business level is likely the best way to push renewable energy into the mainstream. iFame Media provided this article on behalf of AirFun Games, a company dedicated to the sustainable lifestyle while providing party solutions such as water slide rentals and trackless train rentals in Tampa, FL.